Although I mostly review iPad apps for children, I'm fascinated by image editing apps too. Why? I believe it’s because I have a deep appreciation of graphic design and art in general, but also I’m honest enough to admit I would love to one day find an app that lets me make art that looks good. 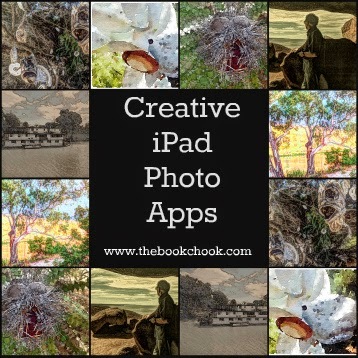 The apps below so far have sadly not turned me into an artist, but they’re tremendous fun to play with, and I often use them when I’m searching for a new way to create a blog image. Perhaps you or your students might find them useful or fun too. Waterlogue: Waterlogue is easy to use and really makes interesting changes to an image. It’s a little like rendering it as a watercolour painting. Once you have an image from the iPad, you simply tap a filter. You can also choose, size, darkness, border or none, and sharing options. Percolator: This is an intriguing app that transforms your photos into bubbly mosaic style images. Once you choose an image from your camera roll, or snapping a new one, it’s a matter of playing with the different settings beneath the image. It’s a little slow, but the result can be really interesting. It might be fun for children to use this app to filter images and then set up a guessing competition for others to identify the original image. Lots of sharing options. Moku Hanga: I told you about Moku Hanga in Play with Images - iPad app, Moku Hanga. Moku Hanga is named after the Japanese technique for woodblock printing, and it gives that "look" to a photo. Great sharing options here too. Painteresque: With filters like lithograph, coloured pencil, charcoal, and rainbow you probably have some idea of the results. There’s also a fine-tune setting that allows for much more, finer, variation. It’s so simple to use but the results are stunning. I probably like it for scenery more than people as the lovely texture seems to make skin look leprous. Paper Camera: What I love about Paper Camera is that you actually see the effect on your camera screen before you take the shot. It’s ideal if kids are looking for a cartoon look. You can also change images from the camera roll and tweak with sliders, the way I did with the paddle steamer snap in the collage above. To bring up sharing options, click on the tiny thumbnail of your image to the left of the filter name. Pizap: Responsible adults try to teach kids to use images responsibly i.e. not break copyright. It’s a great habit for children to learn to make their own images from scratch, especially if they are blogging or publishing material online. Pizap offers several backgrounds that kids and adults can use, adding stamps/stickers, text etc to create an image for a range of purposes. There are stacks of stickers, collage templates etc and it’s free. Children in Years Five and Six could definitely learn to use these apps. I have downloaded many others but some languish in the cloud simply because the learning curve is too steep and I don’t have time to pick up how to use them. I guarantee if these are easy enough for me to grasp straight out of “the box”, kids can pick them up fast too. Faster probably! Tweaking an image on the iPad camera roll with a filter, using an editor to make an image from scratch, finding a unifying “look” for images in a comic template - all are wonderful activities to help children create and develop visual literacy skills. Kids will also relish thinking outside the box and using more than one app to get new and different results.